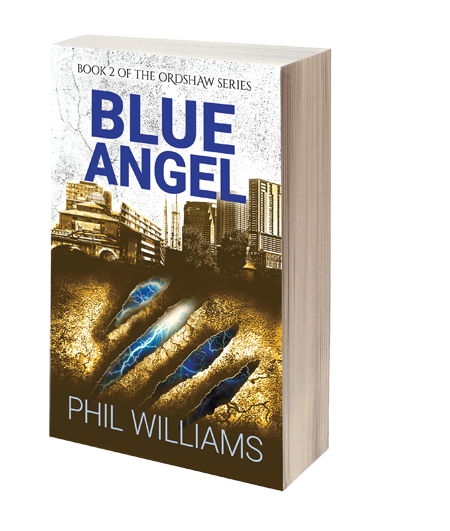 Blue Angel, the second book in the Ordshaw series, is now available in eBook and paperback format, from Amazon here. So what’s it all about? Blue Angel picks up directly where Under Ordshaw leaves off – the next chapter in a thrilling jaunt through the UK’s worst-behaved city. I won’t give any spoilers here, but needless to say many favourite characters are back for more, with plent more dangerous monsters and an ever-twirling conspiracy of lies and revelations. The good news is that while the Ordshaw series was always going to be expansive, my aim was to create a satisfying pairing with the first two books. Blue Angel by no means ends the story, but it at least delivers the madcap events sparked off at the start of Under Ordshaw to some kind of conclusion. Blue Angel is the middle part of a 3-part opening trilogy for Ordshaw – the Sunken City will return in the third book, The Violent Fae. Check out Blue Angel here to continue the adventure now.